It’s been quite a transformation for Niall McInerney. 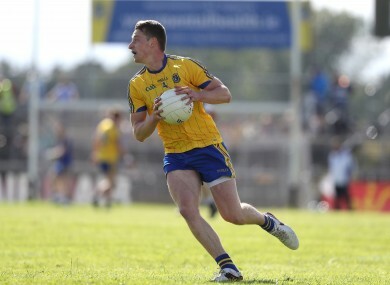 Niall McInerney in action for Roscommon against Sligo. WHEN ROSCOMMON SAW off Sligo last month, Niall McInerney celebrated after lining out at corner-back. When Roscommon had suffered a stunning upset against Sligo a year ago, McInerney was thousands of miles away with football far from his thoughts. “I was in America last summer. I took a break and went, I was in Santa Barbara. “I didn’t play any football out there at all. The weather was unbelievable and just to get a break from the football was good. “To be honest the first time I saw that Sligo match (in 2015) was about four weeks ago. I didn’t watch it at all, didn’t play or watch football at all over there. McInerney came on as a sub in the 2014 All-Ireland U21 final hammering that Roscommon suffered against Dublin. That campaign was then a springboard to a summer with the senior squad. The new Roscommon management appointed at the start of the season were not unfamiliar to St Brigid’s club man McInerney. “I worked under Kevin (McStay) before. I was only 17 or 18 when we won the All-Ireland (club). I was just on the fringes of the team, I didn’t start or didn’t get a game. “Kevin and Liam (McHale), they bring something different. They are two very interesting characters and you just learn so much from them. It was good for me at the start of the year because I knew there style of play and I knew what they were like. McInerney has not lacked in commitment to the Roscommon cause this year. He’s just finished studying third year medicine in UCD with an inter-county career. “The travel down from Dublin would probably be the main thing. I’d say this year doing both probably helped me. “You’d know ‘I’ve training this evening’ so I’d have my study time scheduled from nine to five or whatever it is. So it brings that bit more focus to your life. If you weren’t playing football your diet might go down. Galway are the obstacle to overcome for Roscommon in Sunday’s Connacht final and there’s Tribesmen links in McInerney’s family. “My Dad is from Galway and my Dad’s uncle played hurling for Galway back in the days of Christy Ring. There will be a bit of banter in the family. He is from Gort, a hurling stronghold. “He’s tapered down the Galway allegiance over the last few years! But I definitely remember when Galway won the All-Ireland in 2001, we went down to Galway and got the cup. 10 years after All-Ireland win, 6 years after Connacht glory, what brought Roscommon boss back? Email “From working in a Santa Barbara ice cream parlour to playing in a Connacht football final”. Feedback on “From working in a Santa Barbara ice cream parlour to playing in a Connacht football final”.